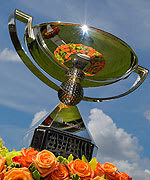 • "It's only four years old, but 40 years from now, there should be a lot of history in this trophy. And to have 'Tiger Woods, Vijay Singh, Tiger Woods, Jim Furyk' ... I'm very proud of that, because those two can flat play -- two of the most dominant players of my era, for sure." • "This (FedExCup) is very special to me, but I knew if I worried too much about this I couldn't get that if that makes sense." • "To win the season trophy here is just a lot of fun. There was a lot riding on my round today, a lot riding down the stretch in some terrible weather, and I was able to -- although it didn't look pretty the last three, I was able to get the job done and win again, and this is very special." Winless in back-to-back seasons for the first time in his professional career, Jim Furyk notched three victories and four other top-10 finishes in 2010. He broke out of his winless drought in just his fifth start at the Transitions Championship. Furyk jumped to No. 2 in the FedExCup standings when he won a playoff at the Verizon Heritage in April and remained in the top 10 throughout the regular season. After being disqualified from The Barclays when he missed his pro-am tee time, Furyk fell to No. 11 in the standings. He took a one-shot lead into the 72nd hole at East Lake, but missed the green of the par 3 to the right, landing in a bunker about 50 feet from the hole. Needing to make a par to win THE TOUR Championship and the FedExCup, Furyk knocked his shot within three feet and tapped in for victory.